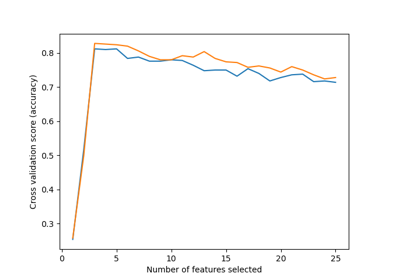 Feature ranking with recursive feature elimination and cross-validated selection of the best number of features. If greater than or equal to 1, then step corresponds to the (integer) number of features to remove at each iteration. If within (0.0, 1.0), then step corresponds to the percentage (rounded down) of features to remove at each iteration. Note that the last iteration may remove fewer than step features in order to reach min_features_to_select. The minimum number of features to be selected. This number of features will always be scored, even if the difference between the original feature count and min_features_to_select isn’t divisible by step. For integer/None inputs, if y is binary or multiclass, sklearn.model_selection.StratifiedKFold is used. If the estimator is a classifier or if y is neither binary nor multiclass, sklearn.model_selection.KFold is used. Changed in version 0.20: cv default value of None will change from 3-fold to 5-fold in v0.22. Number of cores to run in parallel while fitting across folds. None means 1 unless in a joblib.parallel_backend context. -1 means using all processors. See Glossary for more details. The number of selected features with cross-validation. The cross-validation scores such that grid_scores_[i] corresponds to the CV score of the i-th subset of features. The size of grid_scores_ is equal to ceil((n_features - min_features_to_select) / step) + 1, where step is the number of features removed at each iteration. [R6f4d61ceb411-1] Guyon, I., Weston, J., Barnhill, S., & Vapnik, V., “Gene selection for cancer classification using support vector machines”, Mach. Learn., 46(1-3), 389–422, 2002. The following example shows how to retrieve the a-priori not known 5 informative features in the Friedman #1 dataset. fit(self, X, y[, groups]) Fit the RFE model and automatically tune the number of selected features. predict(self, X) Reduce X to the selected features and then predict using the underlying estimator. score(self, X, y) Reduce X to the selected features and then return the score of the underlying estimator. transform(self, X) Reduce X to the selected features. The decision function of the input samples. The order of the classes corresponds to that in the attribute classes_. Regression and binary classification produce an array of shape [n_samples]. Training vector, where n_samples is the number of samples and n_features is the total number of features. Target values (integers for classification, real numbers for regression). X with columns of zeros inserted where features would have been removed by transform.